Jackson County is just a day’s drive for almost half of the U.S. population, making it a convenient escape for a two- or three-night getaway. Need a charge on your way? Our Level 2 EV charging stations in Sylva and Dillsboro can charge any electric vehicle except Tesla. If you have a Tesla, nearby Cherokee has you covered! 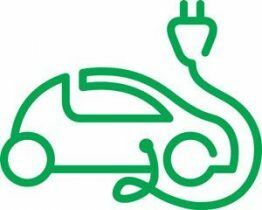 Cars can recharge fully in a few hours, which gives you plenty of time to explore the wonderful shops and restaurants around town! • Sylva has two electric car charger pedestals and 4 charging cords total (located at Bridge Park along Railroad Avenue, Sylva). Charger model: Schneider Electric EV230PDRR. Free of Charge. • Dillsboro has one electric car charger pedestal with 1 charging cord (located next to the Post Office in Dillsboro along Depot Street). Charger model: ChargePoint CT4000. Fee-based, credit cards accepted. • Cherokee has two charging stations located at their welcome center located at 498 Tsali Boulevard. The first model is a Schneider Electric EV230PDRR and has 2 charging cords total; the second model is a Clipper Creek Tesla charger that has one charging cord.